Jump-starting growth of forest on eroded parts of farms can slow the loss of topsoil and help restore soil fertility as well as ecosystem services and wildlife. How can we address the fundamental problems of soil erosion in deforested tropical farmlands and the economic and ecological losses that it causes? Can we slow erosion and restore soil fertility and farm productivity as well as ecosystem services and production of goods? Can we accomplish this cooperatively and with sensitivity and respect for the local people—a bottom-up rather than top-down approach? Our main approach has been to tap local knowledge and needs and then do controlled, replicated experiments and observational studies to gather new knowledge. 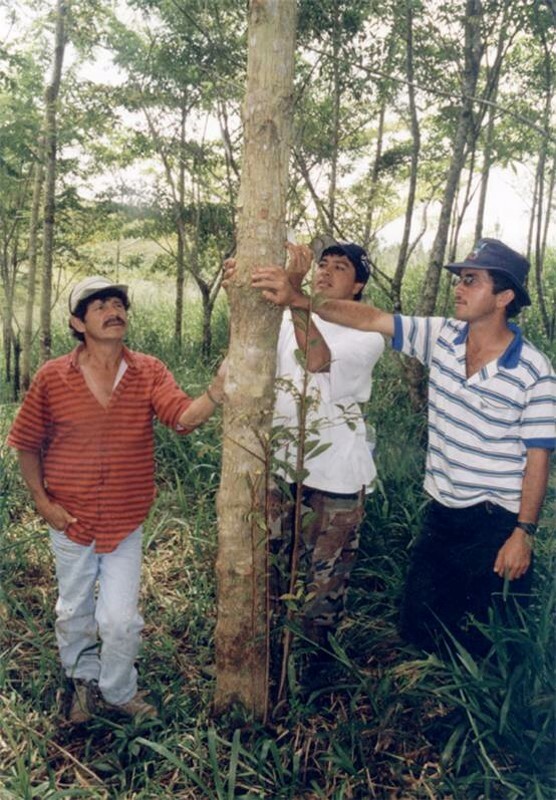 Then we apply our knowledge to find inexpensive ways to reduce erosion, restore soil fertility, and regenerate tree-based ecosystems on degraded land typical of old farms in Central America. For these long-term experiments in southern Costa Rica, a deeply eroded 63-acre (25 hectares) farm named Finca Cantarrana was bought in 1992. 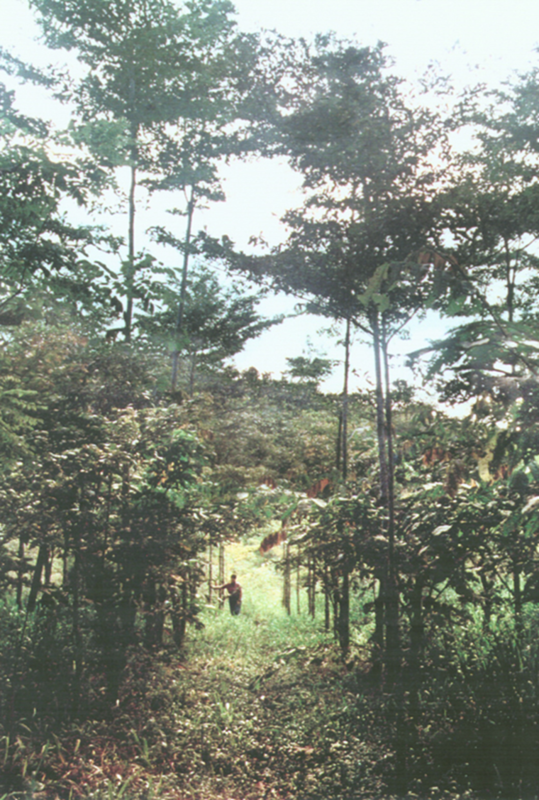 The first native tree seedlings were planted there in 1993. Our approach concentrates on trees for many reasons. Trees are most likely to restore the ecosystem services as well as much of the wildlife of the original forest. Multi-layered tree canopies are effective in slowing erosion by intercepting the force of torrential rains. Vertically layered ecosystems also are associated with higher biodiversity, especially birds. The root systems of trees re-establish the fungal-soil ecosystem that also protects topsoil. Together, the above- and below-ground systems act to recycle mineral nutrients from the sub-soils and restore the fertile humus-containing topsoil at the surface. Furthermore, the local people know which native trees provide various goods such as fruit, timber and fuelwood, and over the years have recommended various species that we should try. Thus folk wisdom collaborates with science in our bottom-up approach. If we are able to demonstrate the restorative potential of valuable species of trees, we find the local people anxious to plant them themselves. If you like our approach and want to see us continue, think about a tax-deductible donation--of any amount! click on the donate button. deploying other kinds of hardy plants such as Vetiver grasses that promote erosion-control, growth of neighboring target trees, and/or topsoil regeneration. These experiments have led us to work on the soil-fungal interface mentioned elsewhere and on special soil chemistry such as aluminum sequestration by some trees. Go to PROJECTS page for photos and descriptions of some of our experiments and observational studies. Our studies are usually collaborations between Lynn, her students, and/or foresters and academics from other international institutions. The video that follows was filmed at the farm in 2007 by an undergraduate art major, Ken Woodall, who produced it as a project for his department at UCI. The fact that several of our trees planted in our earliest experiments have yielded valuable timber and are reproducing themselves with flowers and fruits attests to the success of many (though not all!) of our experiments. Left to right in the panel below: pine planks, Vochysia flowers, Terminalia seeds, Calophyllum babies--all produced on the farm from our planted trees. We support local outreach that benefits the local people. We are well-known in the community. Our program has been collaborative and interactive from the start in that farmers often give us information and suggestions that lead to future experiments. In turn we share our research results with local people in various ways, ranging from formal workshops at the farm to invited talks at the farmers' association and informal visits to their homes. Project Director Dr. Lynn Carpenter and Project Administrator Eduer Sandi give tours of the permanent experiments to high school students and graduate students from the nearby Las Cruces field station of the Organization for Tropical Studies (O.T.S.). Our outreach is done in both Spanish and English. We make seedlings from our tree nursery available to local projects put on by the schools and the indigenous reservations. Our personnel are good citizens of the community. For example, we played a major role in getting the government to bring purified piped water to the community, even helping to dig the trenches! Outside Costa Rica, our educational outreach includes presentations by Dr. Carpenter and her students back in the U.S. to audiences ranging from church groups and elementary schools to international conferences abroad. In addition, in her courses, Tropical Biology and Freshman Biology taught most years between 1993-2010, Dr. Carpenter included a section on R.A.I.N.’s work as an inspiration to students. Click here for more information and fun photos of our outreach program! Sequence shows growth of planted seedlings in an area we call "Inga alley". Left to right: 1993, 1995, 1999, 2001, 2006.